Belgium 1870, entire letter from Ostende (28.6.) 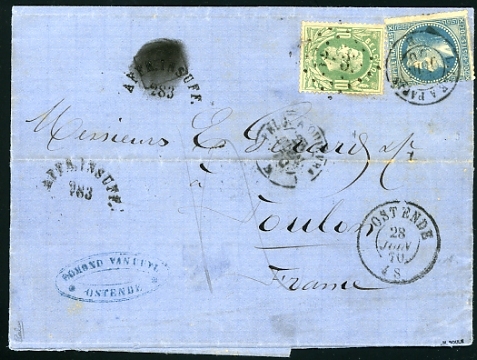 send to Toulon, France bearing a unique mixed franking with Belgium 10c green Leopold I tied by "283" numeral and France 20c blue Napoleon cancelled by cds "LILLE A PARIS 29 JUIN 70" with AFFR INSUFF 283 alongside and 40 centimes postage due. A few small faults but a very interesting cover. Signed by Roger Calves and Boule.